Fujitsu has developed a prototype haptic tablet that uses ultrasound to create a sensation of texture on the screen. 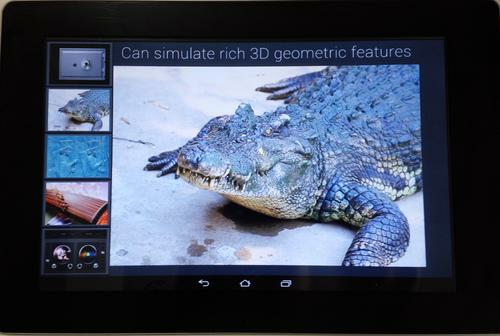 Fujitsu has developed a prototype tablet that lets users feel realistic textures of images displayed on the screen. The 10.1-inch haptic tablet is the first of its kind to use ultrasonic vibrations to create a sense of tactile sensations, according to Fujitsu. It can convey a feeling of slipperiness or roughness that could accompany images such as a wet surface or the skin of an alligator. Other companies have created similar prototypes, but Fujitsu Laboratories' take on the idea uses ultrasound to change the friction between the touchscreen and the user's finger. To create a floating, slippery effect, the tablet generates a high-pressure air layer just above the screen. That reduces friction and creates the illusion of slipperiness. To create a bumpy or rough effect, the device generates high- and low-friction zones through ultrasonic vibrations. The tactile, visual and audio sensations can create a rich illusion. "Fujitsu's method of using ultrasonic vibrations achieves an unprecedented slippery sensation, while keeping noise to a minimum," a Fujitsu spokesman said. "We are proud of the advanced audio and visual technologies our products offer, and with this new technology, we are exploring ways to appeal to even more senses for a more complete experience." The spokesman emphasized the technology is still at an early stage of development, but applications might include electronic catalogs that would generate a sense of texture for their products. Musical applications could be another use. A version of the prototype on display at Mobile World Congress 2014, which kicked off Monday in Barcelona, Spain, gives users the sensation of plucking the strings of a koto, a traditional stringed instrument from Japan. The spokesman would not elaborate on how the technology might be commercialized or how something like a haptic digital catalog might be produced. He said the company is reviewing the possibility of creating customized haptic sensations. Fujitsu is planning to continue its research on the tablet, however, with an eye to commercializing it in the company's fiscal 2015. In 2012, mobile carrier NTT DoCoMo launched the Medias Tab UL N-08D. Manufactured by NEC, it contains HD Reverb haptic technology by Immersion. Finland's Senseg has also developed haptic tablet technology.